I have successfully 'converted' many non-duck eaters, to happy 'gourmands' with this preparation of 'magrets' or duck breast. First, you must realize that duck is a red meat, and can be cooked and treated the same as high quality beef-- very much like prime rib or steak, It can safely be eaten pink and juicy (the best way to enjoy it!) We love this simple meat on a Saturday night stay-in date night. After you have preheated your oven to 200C / 400F, score the thick skin of the duck breast with diagonal cuts, careful not to cut into the meat. Season both sides with salt and ground pepper and place skin side down in a COLD pan on a medium heat without oil for 5 minutes or until golden brown, while pouring off the fat regularly. Next, place the duck breasts skin side up in the pan in the middle of the pre-heated oven. Cook for 8 -12 minutes, depending how you like your duck cooked - medium-rare to medium is recommended. When the duck is cooked to your liking rest the meat on a platter or cutting board for at least 10 minutes (if you can wait!) -- so that the juice remains in the meat and doesn't run out. While the breast rest, you can make an easy sauce by de-glazing the pan with wine and broth while sauteing shallots -- and then finishing with cream. We love the traditional ‘Calvados’ sauce made from the liquor that originates in Normandy. With a small amount of duck fat, in the same pan, gently saute the shallots. Once tender, carefully add the Calvados while scraping the pan of all of the good bits. If you are fancy and know how to do flambe — you can cook off the alcohol in the sauce by tilting the pan and lighting the vapors with a match. I am not an expert at this and so I tend just to cook down the Calvados instead, then add the stock and reduce by half before finishing with the cream. Season with salt and pepper. You can skip the sauce all together and just serve with a nice whole-grain mustard. 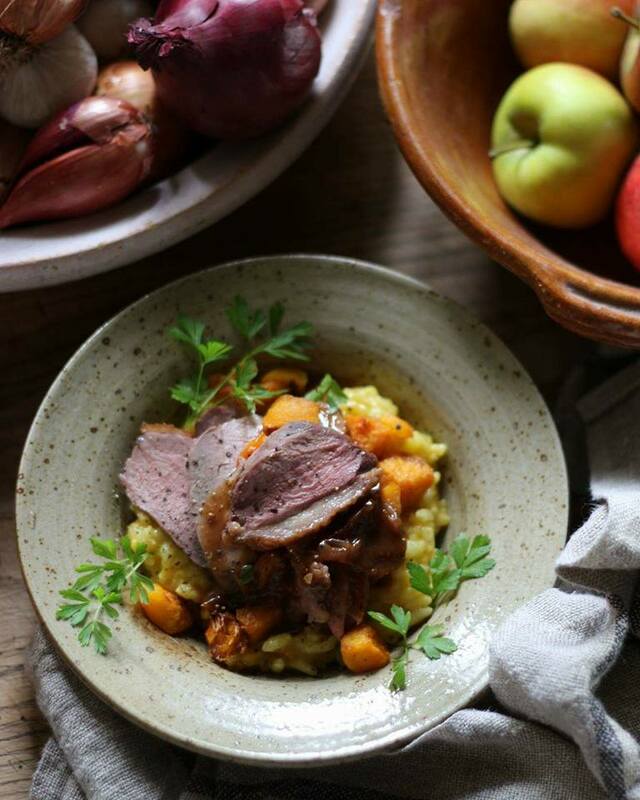 Serve the sliced duck breast over risotto, pureed vegetables (we love sweet potatoes or celery root) or simply with a salad. Enjoy!